Investors continue to flee the stock market and move their money into bonds. U.S. stock mutual funds lost $1.87 billion during the week ended Oct. 24, according to the Investment Company Institute. 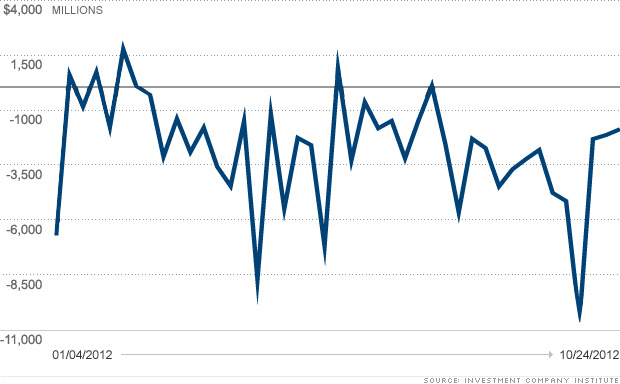 That's an improvement over the prior week, when investors pulled $2.12 billion out. At the same time, investors continued to add to their bond holdings with U.S. bond mutual funds seeing inflows of $6.6 billion. And ICI data show that hybrid funds, which invest in both stocks and bonds, brought in $1.3 billion in the latest week. Investors have had to contend with less-than-stellar corporate results during the past few weeks. While the bulk of companies have been beating earnings estimates, sales have been less impressive and more firms have issued tepid outlooks. All of that is leaving investors disenchanted with stocks, despite what's been a pretty good year so far. While the S&P 500 (SPX), Dow Jones Industrial Average (INDU) and the Nasdaq (COMP) have gained between 8% and 16% this year, individual investors, have missed out on the rally and don't seem to believe in it enough to put their money in stocks. Stock mutual funds have seen outflows during most weeks of 2012. Last week marked the 14th consecutive week when investors pulled money out of stocks. Investors only added to their stock mutual fund holdings during six out of 42 weeks this year. The rush out of stock has been more dramatic this year than in year's past. U.S. stock mutual funds bled nearly $113 billion during the first 10 months of 2012 compared to $98 billion during the same period in 2011 and $62 billion in 2011. As investors seek safety, despite the Federal Reserve attempting to push them in the opposite direction, bond funds have seen inflows of more than $285 billion this year.